Häze, the Icelandic modder well-known for its original products has worked in partnership with Augustin from Phielas Cloud to offer an atomizer, and not every atomizer: Alcatraz RDA. A flavor oriented bottom feeder dripper atomizer of course! 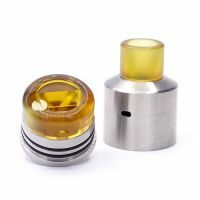 ALKATRAZ BF RDA BY HAZE Elegance and sobriety In terms of design, Alcatraz respects the standards of drippers we can currently fin..